I know that it has been a long time. I hope that you haven’t been missing me. The Mother of Cats has been a severe disappointment for just weeks and weeks. She caught some kind of cold early in December, carried on like a baby for over a week (nasal spray, salt water gargling, boxes of tissues… Yellow Boy and I became quite concerned about her mental health…) and COMPLETELY ignored our needs. As if that wasn’t enough, when she finally got over the virus, she then became even worse. She slept for hours and hours, stayed in her bed even when she was awake, and totally failed to deliver our cookies on time. SHE DIDN’T EVEN DO CHRISTMAS!!! which is totally our favorite time of the year. Hello… Christmas trees = world’s best cat toys. How could she have failed us this way? She said she was in a flare. Whatever. When she was awake she worked endlessly on these socks for her cousin’s Christmas present. The yarn for the socks was from this sock blank that she bought at a yarn festival. She made it into a ball and wouldn’t let me help even a little bit. She wanted to make these complicated socks for her cousin. This cousin is special… they were born two days apart and are kind of like displaced twins. This cousin once gave her a whole quilt for a present. The least she could do was to make these socks! She started knitting the first week of December. Lots of time. I looked forward to days of great knitting together. But she was too tired to knit very long on them at a time, and can I be frank, she was pretty stupid with brain fog. Lots of mistakes. Lots of stress. She kept chasing me away while I was helping. She tried to knit in bed, which is MY place. So I ate the yarn a couple of time. If she gave me cookies in a timely manner these things wouldn’t happen. Her lack of energy and general stupidness was really obvious when she knitted the heels. It took her THREE HOURS to pick up those stitches to knit the afterthought heel. She started sighing and pushing me off the bed. She began to refer to the knitting project as the Turkish socks from hell. The Mother of Cats was really in trouble. I just kept on encouraging her. I purred a lot. I settled for fewer cookies. I even stopped eating the yarn. She was really in pitiful shape. By Christmas Day she had finished this much. Her cousin reminded her that Christmas continues until January 6th. Finally, finally they were done! Those horrid and ill behaved heels look pretty good, don’t they? The Turkish Hell socks were packed up last week and mailed out. On Saturday, the last day of Christmas they arrived safely in their new home. They had better behave themselves and last for years and years; I would hate to travel all the way across the state to whack them into shape! These socks, called Classic Kilim, are from the book Around the World in Knitted Socks by Stephanie van der Linden. The socks were supposed to have tassels and embroidery; that so did not happen! !Here is the info on Ravelry with more info about the book. 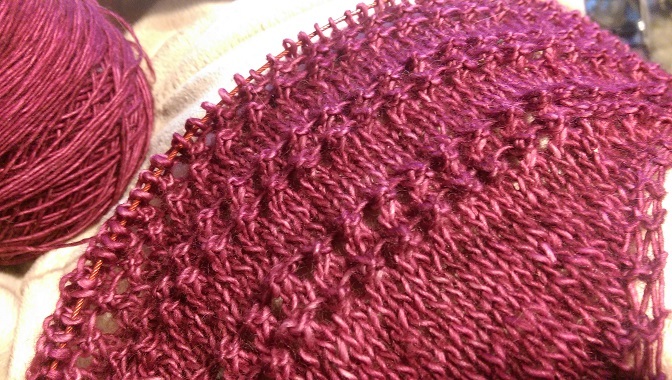 My notes on Ravelry are here. On December 1st I got my pneumonia vaccine even though I had been struggling a little that week. That night my youngest son became ill with complications of diabetes and was rushed to the ER . I spent the next 2 days/nights at the ICU with him. Yep. About the time my son returned to work and I moved back home I was sick; my autoimmune diseases flared while I was fighting through the viral illness. My Sjogren’s symptoms have been off the chart and crushing fatigue and brain fog appeared along with them. This week I am better and have been knitting up a storm and planning blog posts. Hopefully I’ll be online again in a couple of more days. 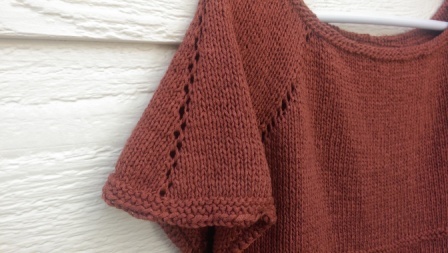 FO Tee, a Garden Swing, and an Excited Spinning Wheel. I know that I have been a little whiny lately. I started methotrexate a little over a month ago and the adjustment to the new medication has been challenging to say the least. This week was better. Much better. So sorry for the whining. I promise hope that I won’t be doing that again for a long time. Check out all the things that were accomplished this week. I got the Clove HItch Tee finished! Here are the project notes on Ravelry. Look at how cute the lace detail is on the sleeve. This yarn is a linen blend and will be cool to wear even though it is a worsted weight knit. The whole time I was knitting this tee I worried about how big the neck opening was. As soon as it was cast off the needles I tried it on, and yep, too big. I ran a drawstring around the neckline on the inside to draw it up a little and to prevent more stretching. Neckline problem totally fixed: it fits great! The top is loose and a comfy layering piece. 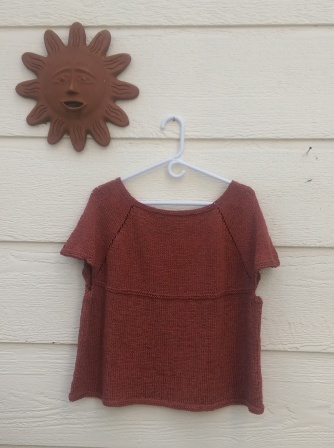 I’m thinking that I would like to make a second one with long sleeves using a winter yarn that will be lighter in weight. Maybe in navy blue. I plan to keep that garter stitch band on the sleeve and will continue the sleeves in stockinette below the band. I have now crocheted the entire back of the lawn swing and am continuing on to make the seat. 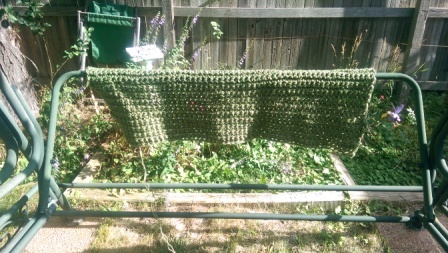 I draped this over the back of the swing; it’s longer than it looks in the picture. The lawn seat is coming right along. The fabric will stretch when I sew it into place so it will be more open looking when it is done. I haven’t completely decided how to attach it to the side pieces of the frame. I’m afraid that the attachment solution won’t be very elegant, but hopefully it will be functional. Today I took the car to get its oil changed and battery replaced. I know that this sounds like a small thing, but I am rocking my good week and getting a lot of things done. 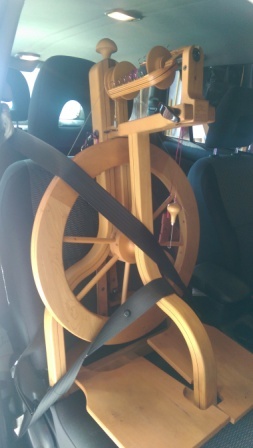 After I got home I cleaned out the garage and packed my spinning wheel into the car because tomorrow we go to a class to learn how to spin camelid fibers. Look! The wheel is already strapped into the car and ready to go. It is so excited! This is its first trip out in almost a year; no more sulking in the corner for this little guy. That’s right. I still have a bag of paco-vicuna that I am nervous about spinning. The spinning class is taught by Chris Switzer who has quite a reputation as a master spinner of these fibers in this part of the world. I am taking the paco-vicuna bag and a chunk of my alpaca fleece with me to the class to get feedback on spinning techniques for the yarn that I dream of creating. Not that I’m intimidated, but the class registration says to bring some things that I’ve made from my homespun yarn with me. I have spent an hour finding things that I’ve made; I’ve decided to only take two three things. Maybe three is too many? If I take two substandard items she might think it’s a fluke. If I have three, it’s pretty sure that’s the type of spinner I am. Whatever. It’s best to not overthink this. I’ll take three that I like and that will be that. I’m taking the class with a friend who likes to spin crazy lace weight yarn and it is going to be wonderful!! I finished reading all of the bee books this week too. I feel another post coming on. Some of the books were a little bit of a chore to finish, others were just amazing. Hmmm…. Author Midnight KnitterPosted on July 17, 2015 Categories Gardening, Knitting, Scleroderma, UncategorizedTags Alpacas, Chris Switzer, Clove Hitch Tee, Courtney Cedarholm, crochet, garden swing, Knitting, Methotrexate, Paco-Vicuna, scleroderma, Sjogren's Syndrome, Spinning, spinning wheel, System Sclerosis, Tees, Tops8 Comments on FO Tee, a Garden Swing, and an Excited Spinning Wheel. Without a doubt, I am in a mood. I have been feeling poorly for a couple of days now (I took my methotrexate on Monday, and this week it made me sicker than last. Hope this gets better as I continue…), but I needed to pick up prescriptions from the pharmacy and to run some essential errands (the cats expect to be fed on a regular basis; obviously they are out of control!! ), so I dragged myself out of bed and feeling a little dizzy and wobbly I headed out. Here’s the deal. 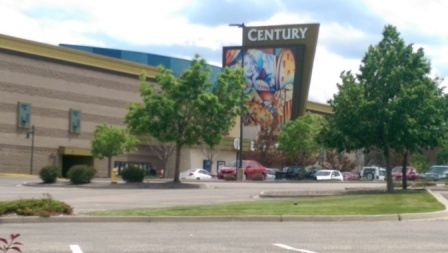 The Kaiser facility where I pick up my prescriptions is right across the street from the Century 16 theater where a gunman (who will remain unnamed in this post) opened fire in a packed theater of moviegoers watching a popular movie on opening night. It was almost 3 years ago today when I woke up to discover that once again Colorado was in the news for a mass shooting, and once again it was happening in my home town. (Sadly I was a resident of Littleton, Colorado at the time of the Columbine shooting). This time the theater is in the heart of my shopping district, and today as I made my rounds to pick up a library book, buy cat food and made a quick stop at the book store to check (what else) the knitting magazines I was almost always in sight of the theater. This what the theater looks like today after an extensive remodel. I still haven’t gone there to watch a movie since the shooting. It is pretty heart-rending if you think about it. The police drove up the lawn and over landscaping behind the theater that night to transport victims to local hospitals. They drove on the street that I used to go to Kaiser in patrol cars carrying as many wounded as they could fit into their cars. It’s hard to not think of this as the shooter’s trial is now wrapping up after 45 days, and it’s impossible to avoid the day-to-day details of the events in the courtroom. As I entered the Barnes and Noble bookstore in the shopping center I wondered if that man had come here to also check magazines. 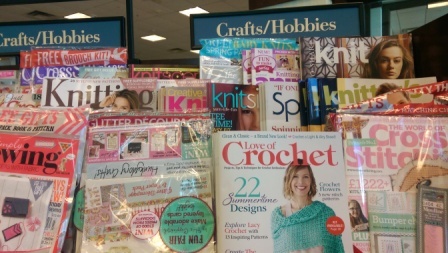 Here’s the knitting magazines on an upper shelf mixed in with other fiber-arts crafting magazines. I counted 12 knitting magazines. Here are the gun magazines. These slick and menacing productions are located on the lowest shelf where kids can sit and go through them, and I counted 30 magazines. I ignored the obvious hunting and gun collecting ones. So, I am in a mood. I don’t feel well. I spend a lot of time knitting to cope with my altered future due to some serious illnesses. I don’t want to start a debate about gun control, Second Amendment rights, mental illness, the death penalty, the available of military grade armaments through the internet, or the value of explosive rounds. I don’t want to hear that we need more guns to stay safe and that teachers should be packing in their classrooms. Don’t do it!! 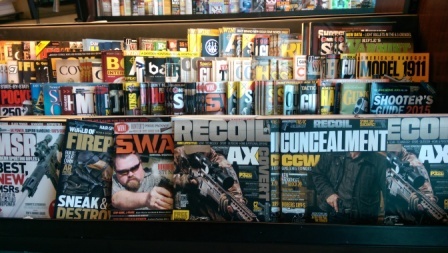 I’m just wondering if the world wouldn’t be a better place if bookstores carried a dozen hard to find gun magazines on their shelves, and there were 30 knitting magazines located at the level of children for them to look through. Wouldn’t it be nice if we all felt safe and dreamed of creating nice cushy scarfs, sweaters and mittens that would be beautiful and useful. That knitting was seen as an important meditative activity as wonderful as yoga, jogging, or any of the other stress-busters out there. That the economic power of knitting and other crafting venues drove a huge industry of creative pursuits valued by a large part of the population. What does this say about us as a people that this isn’t the case? Starlight, a Joker and OMG: Empathy Cards!! Wow. It has been really, really rainy here. I had three inches of rain in the back yard bucket (my very-low tech rain gauge) before there was a downpour with hail this afternoon. Needless to say I have been making good progress on my knitting this week. Here’s what has been going on. I got the Sidere Shawl by Hilary Smith Callis finally done and blocked. (Yep. There was another battle with the cats during blocking. This time they totally outdid themselves. One of them THREW UP on the shawl and then tried to bury the mess by raking damp shawl parts over the evidence. I love my cats. I really, really do…) I think that it turned out nice. The shawl used a new stitch to me called Starlight Stitch (Sidere is Latin for starlight) that really made it have strips of interesting texture. 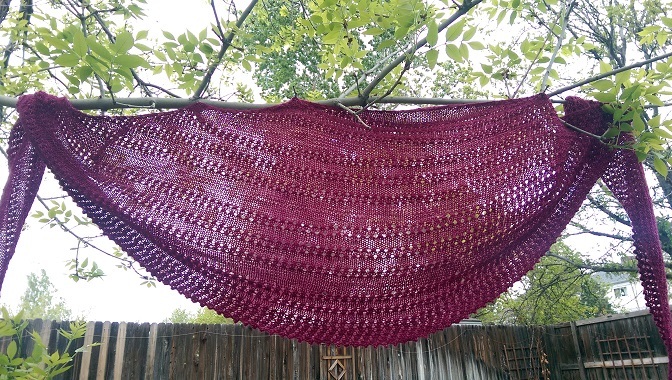 Here is the finished shawl hanging displayed by my ever helpful ash tree. The rows of Starlight stitch open to one side of the asymmetrical shawl. Here are the project notes on Ravelry. 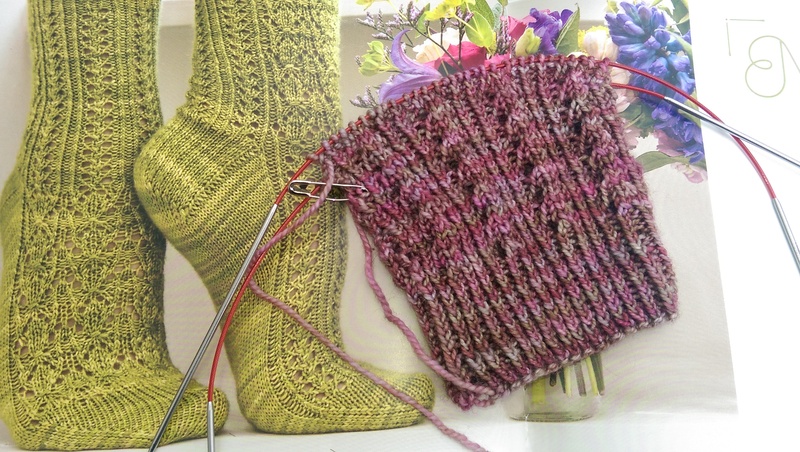 This sock is Milfoil by Rachel Coopey from her book CoopKnits Socks. The yarn is Madelinetosh Sock Yarn in the colorway Grenadine. Since the sock is divided into two distinct halves with different patterns I decided to knit it using two small cable needles instead of my usual (and beloved) square double pointed needles. 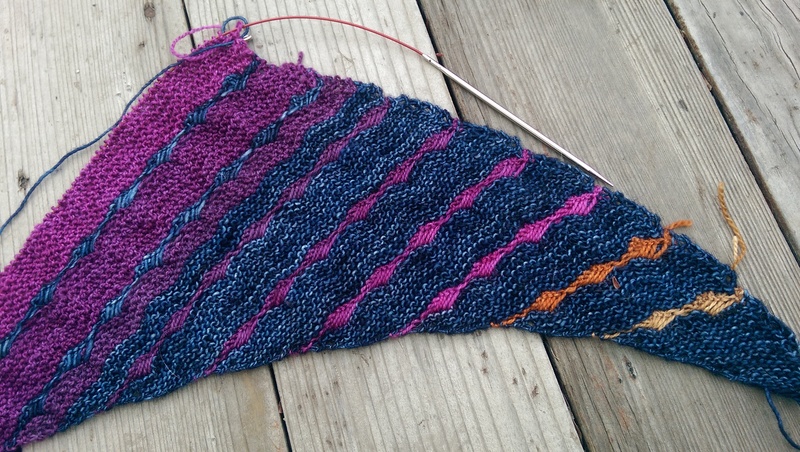 Now that the Sidere Shawl is done I jumped right into knitting the first Joker and the Thief shawl by Melanie Berg. Woohoo!! This one is a keeper for sure, and is lots of fun to knit. Here’s where I am on it right now. The shawl and the sock are knitting up fast, which is a good thing as I have an awful lot of knitting going on. This week has been one of reflection for me as I knitted along in the gloomy rainy days. Tuesday was the anniversary of my mom’s death from ovarian cancer. What a difficult time that was for all of us in the family. Now I am exactly as old as my mom was at that time, and I also am struggling with a serious condition. I’m noticing again some of the things that we dealt with during my mom’s illness: friends and family saying hurtful things, distancing themselves, and trying to make the illness seem trivial. If anything is said at all, it is so superficial or cliche that it reveals a total disengagement. What is up with that? It’s almost as if they are lacking in… empathy. I would love it if someone gave me this card. 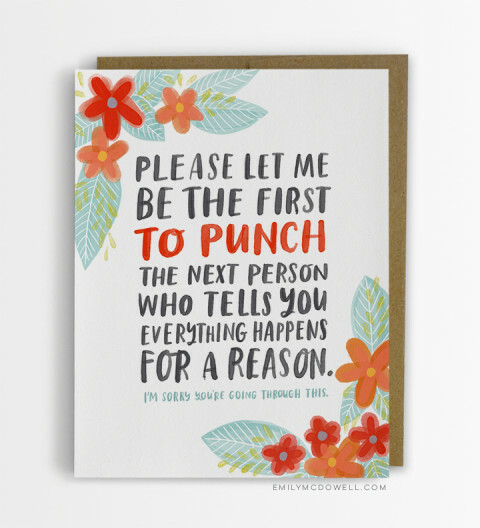 I would love it even more if that person really would punch someone for me! See what I’m talking about? One visitor told my mother that her terminal illness was a “remarkable opportunity” as it gave her the chance to plan the end of her life. I never allowed that person to come visit her again. People who say everything happens for a reason are smugly assuming that somehow your illness was something that you deserved (and they didn’t), or that it will somehow make you a better person. That is just wrong, folks. This happened to me! Not nice! I bet you want some of these cards too. 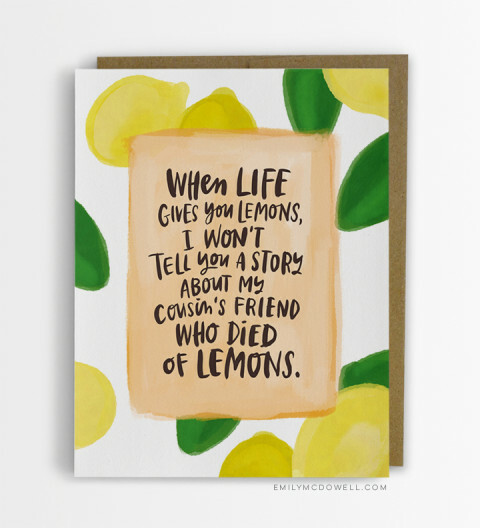 Here’s Emily McDowell’s blog about these cards and her store where you can buy your own. Emily is a cancer survivor and definitely understands the problem and the need for these simple vehicles to scaffold caring and meaningful communication of support for others dealing with a hard time. I know that people do care. We all need help sometimes to know how to show others how we feel. So what other empathy cards should there be? I personally am tired of people telling me that they are glad that I’m so much better. (Say what??! I look better right now because I’m between naps and between crisis…) or that they will pray for me (Thanks! I appreciate that! What I really need, however, is someone who is willing to do some grocery shopping for me or even take me to my next major medical testing appointment of the gastroenterology torture chamber variety…) What about the times when people tell you that at least you don’t have __________ (some other disease that sounds worse to them), or ask if you have your will made? There has to be a great card using these comments! Lots to think about while knitting on a rainy day. Author Midnight KnitterPosted on May 8, 2015 Categories Knitting, Life Lessons, Scleroderma, Shawls, SocksTags autoimmune condition, CoopKnits Socks, Emily McDowell, Empathy Cards, Hilary Smith Callis, Knitting, Melanie Berg, Milfoil Socks, Rachel Coopey, Reynaud's disease, scleroderma, Sidere Shawl, Sjogren's Syndrome, System Sclerosis, The Joker and the Thief Shawl10 Comments on Starlight, a Joker and OMG: Empathy Cards! !